Earlier this year, it was announced via Twitter that the long-awaited Hellboy 3 will not be happening. The creators decided to reboot the comic-book film franchise with a new cast in the film Hellboy: The Rise of the Blood Queen. Almost a decade after the last Hellboy movie, Guillermo del Toro tweeted in February that the third installment of the trilogy will not move into active production. Fans were devastated by the news, but there was some consolation in the planned reboot. Originally, The Blood Queen was to be the third and final movie in the trilogy, with del Toro as director. Not wanting to direct the film, del Toro turned down the project and Ron Perlman was not willing to do it without him. Neil Marshall was next to take over the director's chair. Rather than a continuation, the producers decided that a reboot with no links to the previous films would breathe new life into the franchise. Ron Perlman, in an interview, has stated that he has since moved on to other projects, and won't be back to reprise the iconic role. With Neil Marshall as director, the film is planned to be R-rated and to focus more on action than the previous iterations. 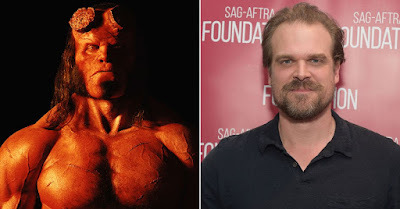 The first photos of the reboot show David Harbour, the new Hellboy, looking like a more muscular Ron Perlman. Award-winning make up artist Joel Harlow is working on the film. Milla Jovovich will portray the titular Blood Queen, Nimue, the antagonist in the film. American Honey's Sasha Lane was casted as Alice Monaghan, an Irish woman rescued by Hellboy who has supernatural abilities as a result of her time spent with faeries. The cast also includes Penelope Mitchell as Ganeida, an elder witch. Brian Gleeson will be King Arthur's Merlin, and Ian McShane will portray Professor Broom, Hellboy's adoptive father. Sophie Okonedo plays Lady Hatton, the resident seer of the Osiris Club, an ancient English club that is dedicated to uncovering supernatural mysteries. Alistair Petrie was also announced as part of the star-studded cast, portraying Lord Adam Glaren, a high ranking member of the club. The initial casting of Ed Skrein as the Japanese-American character, Ben Daimio, had fans outraged and accusing the studio of whitewashing the role. Ed Skrein then withdrew from the role. Ben Daimio will now be played by former Hawaii 5-O star Daniel Dae Kim, a Korean-American actor. Filming is currently underway, and the release date has been set for January 11, 2019.